Successfully Added High Definition Media Server - UPnP Wireless Media Streaming to your Shopping Cart. Hi-def digital media server with UPnP for wired or wireless streaming of digital files (including high definition up to 720P) or internet media such as youtube directly to your TV via high speed LAN or 802.11 B/G connection. Are you ready to take your home theater experience to the next level? 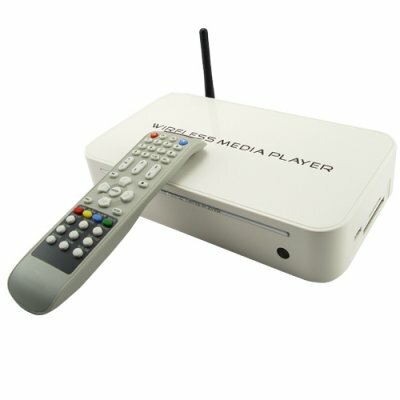 With this High Def capable media server your computer and your TV become new best friends! You'll be able to stream movies and digital media files or any online video directly to your high-def TV wirelessly or via LAN cable. This is the future of home entertainment and you can enjoy it now. This UPnP digital player can stream all sorts of media including embedded internet content to your TV, and it does it with a wide selection of connection types, allowing you to choose what works best for your particular TV setup. How? Once the unit is configured to your home network either by LAN cable or WiFi, you simply connect it to your high definition TV / enhanced definition / standard definition TV via component or composite cables. What are some of the setup possibilities? For the home, you can use it to view web content from youtube or the numerous new web websites streaming TV shows. You can also the view videos and pictures from your computer or memory cards directly on your TV. At the office, you can use it in the meeting room to connect your projector to the network to view and share documents and files. Simply a must have gadget for any AV setup, and available now to you at a fantastic Chinavasion only wholesale price. As always, this wonderful little product is offered to you with no minimum order quantity (M.O.Q.). From the leader in the latest and greatest direct from China electronic products, Chinavasion. Digital media server for wired or wireless streaming of digital files to your TV. Stream movies, digital media files, or any online video directly to your TV wirelessly or via LAN cable. Works for hi-def and standard TV's with a variety of connection types. Media Format Compatibility: FLV, AVI, MPEG4, DIVX (4.0), XVID, JPEG, MP3, MOV, QT, WMA, VOB, DAT, MPEG1, MPEG2 etc. Excellent software (including the device's own firmware). Great design with lots of possibilities for a branded OEM large order. Worked flawlessly out of the box. In a few minutes was properly connected to the network's access point with WPA2 encryption, detected and streamed all the supported media without complicated configurations.